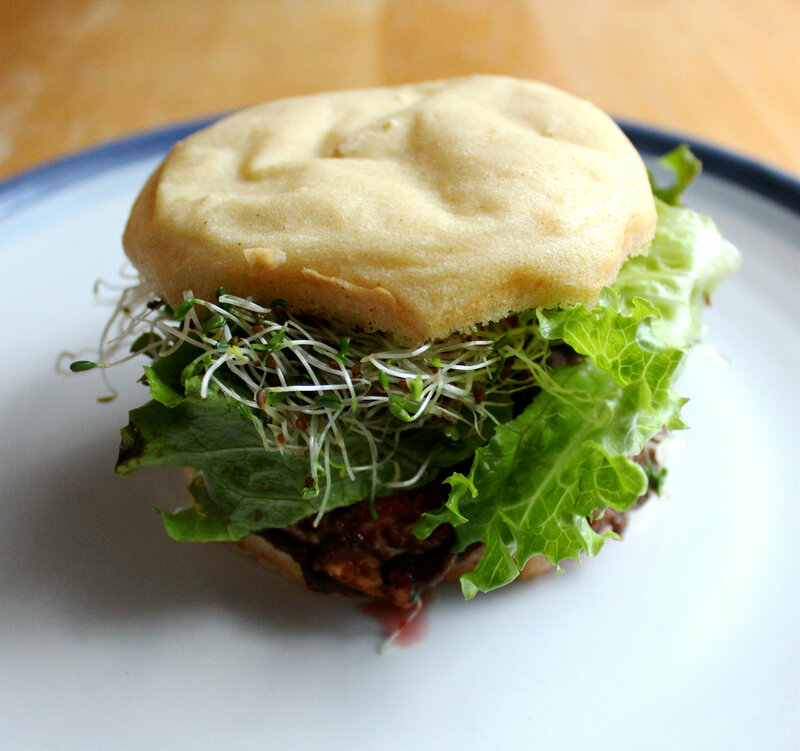 I love portobello burgers! I just had one yesterday, in fact. Yum! I need to bring these back! Sprouts are awesome in everything! 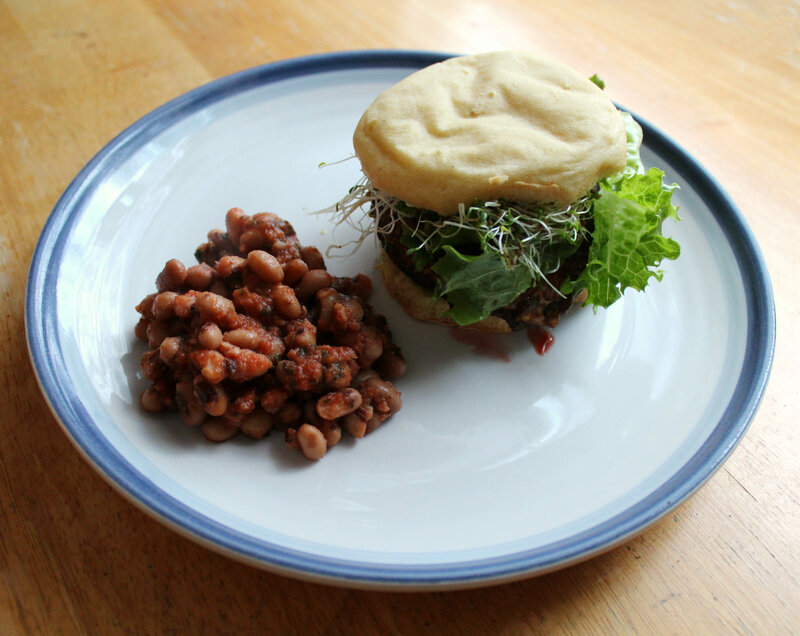 I love a nice juicy mushroom burger and the baked beans are the perfect side dish. Thanks for sharing on Healthy Vegan Fridays! As a veggie this is making me drool! Sounds wonderful and fab photography. Thanks for joining in with #recipeoftheweek. I’ve Pinned and Tweeted this post and there’s a fresh linky live now. You might have already popped over but if not, please do! Very interesting and probably delish recipe!!! Thank you for linking up to the Weekend re-Treat Link party! I LOVE the beans!!! I’m a big fan of baked beans but never think to do them. Summer… I love anything grilled. Especially fruits! I’ve never grilled fruits but I totally intend to this summer! Peaches pineapple yummm! 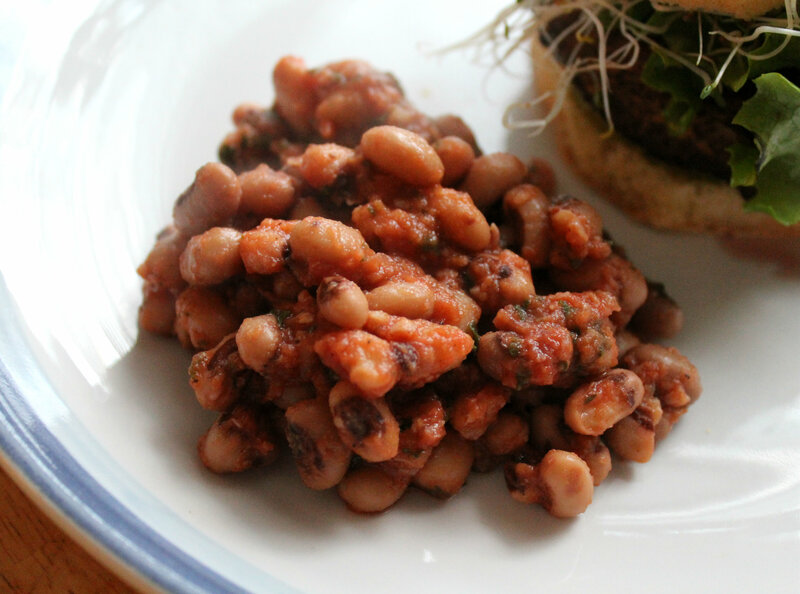 I love the bean recipe – great idea for summer. 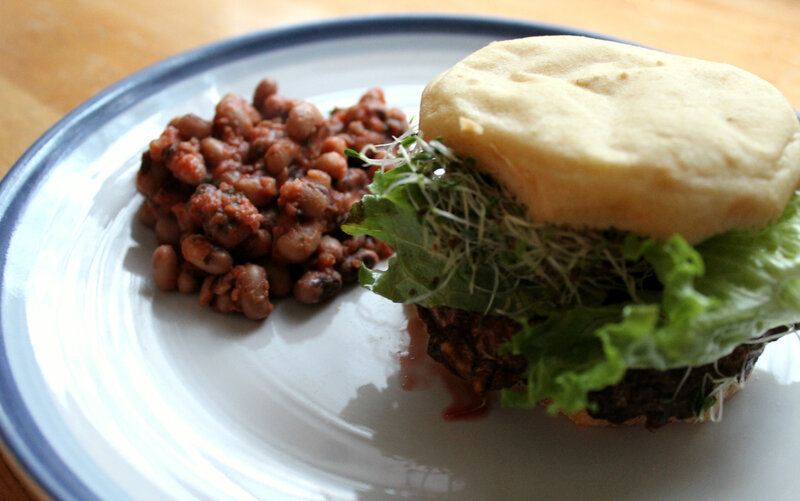 Thanks for sharing on Real Food Fridays Blog Hop! Always a pleasure to have your recipes. The burger looks incredible, what a great vegetarian alternative. Bring on the summer and the BBQs! Forgot to say I was popping over from #TastyTuesday. This looks amazing! The “beans” sound very interesting, in a good way. I haven’t had black eyed peas much, but I’d love to try that. 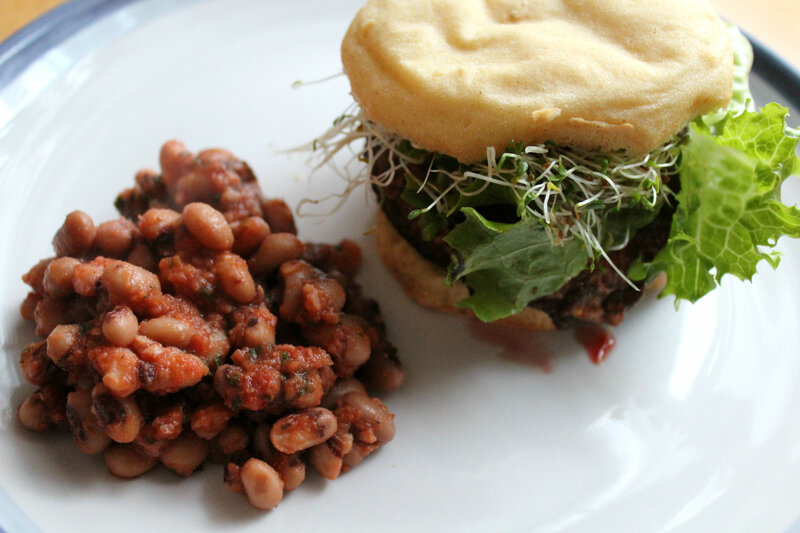 Wow looks delicious and such a healthy alternative to meat! Please do add a link to Tastytuesdays. Thanks for linking up! Thanks love! Opps, I forgot to add it! New linkup sorry! This sounds and looks absolutely AMAZING. You got yourself a winner girl! I love having portobello burgers. Thanks love! This was my first time ever making portobello burgers and they are definitely going to be a staple! My favourite summer food has to be the fresh fruit! But big, perfectly ripe avocadoes always remind me of summer too! Mmm summer fruit is the best! Here you go again providing our next Meatless Monday meal, thanks! 🙂 This looks amazing, the true test will be sneaking it by my husband but I think that will be easy enough. 😉 We grill all year round, one of the perks of living in southern AZ. You won’t need to sneak it! They are so good, anyone will love them 😉 And I am so jealous that you just said you live in AZ…..please send the warmth up here to NJ…we need it! We grill all the time during the summer! Justin typically does the grilling and he’s grilled me Portobello mushrooms and they’re SO good! This looks wonderful! All this grill talk is making me want summer to get here really, really badly! Me too, me too! It can’t get here fast enough. I feel like it will never be here….so grilling indoors it is!